21 and Older Only. Learn the basics of wet felting with Kim Cameron. 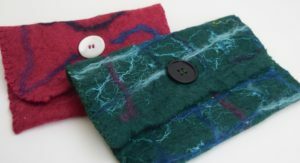 During this two hour class Kim will teach you all you need to know to make this lovely clutch purse (I use mine as a cosmetic case - it's awesome).